After Halloween I still had quite a lot of chocolates leftover and I also wanted to use up the rest of my liquid egg whites up and what better way to use them up by baking something yummy for one of the new editions to my bookshelf. 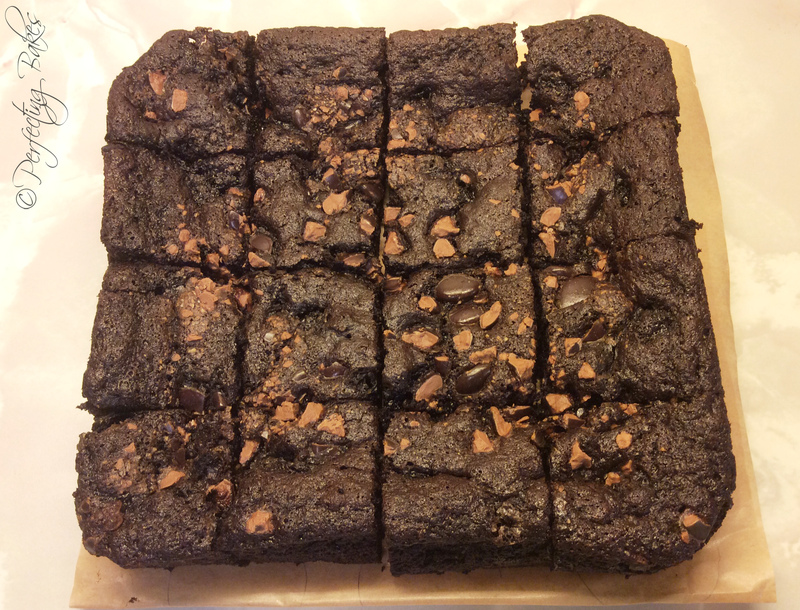 The recipe that I decided to go with this Brownie recipe which comes from Lorraine Pascale’s A Lighter Way To Bake – Blooming Brownies. 1. Preheat the oven to Gas Mark 4 and line a 20cm (8 inch) square tin with baking parchment. 2. In a small saucepan melt the butter over a low heat, remove the pan from the heat and then add the chocolate, setting aside so that the chocolate can melt. 3. Meanwhile, put the eggs and egg whites into a large mixing bowl or in the bowl of your stand mixer and whisk them until they are pale and fluffy. Add the sugar in bit by bit, whisking after each addition until it is all combined and the mixture is really light and mousse-like. 4. Once the chocolate is melted, give it a little stir, then carefully pour it around the whisked-up eggs. This so that you don’t knock out any of the air. 5. Lightly scatter over the wholemeal flour and bicarbonate of soda, and then sift the cocoa powder on top. Gently fold everything together really well but being carefully not to knock out any of the air. Tip from Lorraine – The melted chocolate has a habit of sinking to the bottom of the pan, so really get underneath the egg mixture to ensure everything is well combined. 6. Carefully pour the mixture into your lined tin from a very low height, this so you don’t knock any air out. Smooth the brownie mixture out evenly using the back of a spoon. Sprinkle the broken up Minstrels on top of the brownie including a few extra whole ones. Tip from Lorraine – There is no raising agent in this, so the only way it will puff up in the oven is down to the air that you have whisked into it. 7. Bake the brownies in the oven for 20-25 minutes until springy to the touch but crusty on top and until a skewer pierced into the centre comes out clean. Remove from the oven and leave in the tin until cool enough to handle. Remove your brownie from the tin and place on a wire rack to cool completely, once cool cut into 16 even-sized squares to serve. I really like the Galaxy Minstrels topping this brownie I might add a little more next time, I also think that Galaxy Counters or even Malteasers would work great too. I found these brownies really moist and delicious as well as the Minstrels I might try a variation of adding chopped chocolate into the actual mixture of the brownie, I mean if your going to have a chocolate Brownie don’t skimp on the chocolate. These look amazing! Brownies are a classic. I tried shaking them up a bit recently and the results went down really well.